State Open Diving Championship action in Hartford, Conn., on Tuesday Mar. 12 2019. 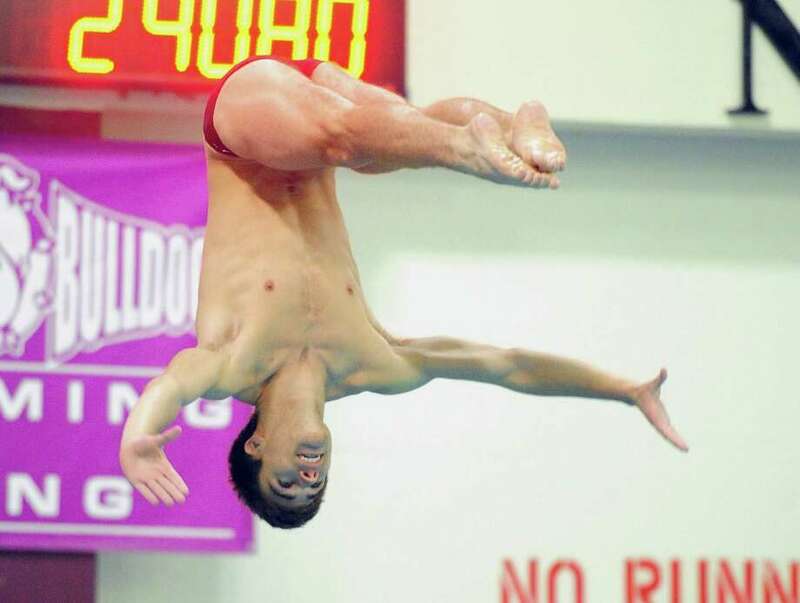 Norwalk High senior diver Kevin Bradley needed every one of his 512 points Tuesday night at the State Open Diving Championship at Bulkeley High School’s James Brophy Natatorium. Bradley successfully defended his State Open diving crown as he held off Sheehan High’s Andrew Buehler by 1.05 points. It was high drama as Bradley saw his 33-point edge after Round 9 of 11 dives shrink to 11 points after Round 10 and then a single point at the finish. The win allowed Bradley to win the diving trifecta for the second straight year. He is the two-time FCIAC, two-time Class LL and two-time State Open diving champion. Sheehan’s Buehler was thrilled to close out his senior year and high school diving career in such style. Buehler finished third in last week’s Class S diving. He came into the State Open with the lowest qualifying point total (360.45) in the 24 diver field. Bradley was able to survive the closing hiccups because his 11-dive repetoire has more high value dives (2.2 difficulty or higher) than everyone else in the 24 diver field. Bradley was able to write his script this season because he made his decision early last fall to attend and dive for the University of Michigan. The New Canaan High School divers — having celebrated a Class L title with the Rams’ swim team last Monday night at Southern Connecticut State University — gave the Rams another huge points boost heading into Thursday’s State Open Swim Championship where Greenwich High awaits. Junior Jackson Camporin was third at State Open diving with 449.20 points. NC junior James Ragusa was fourth with 447.45 points. Junior George Moore (443.85) was seventh with junior Connor Cloud (442.95) in eighth place. In the end, nobody had the answer to stop Mr. Bradley from his date with diving history. 1, Kevin Bradley (Norwalk-McMahon) 512.95 points; 2, Andrew Buehler (Sheehan) 511.90. 3, Jackson Camporin (New Canaan) 449.20; 4, James Ragusa (New Canaan) 447.45; 5, Andrew Bell (South Windsor) 445.60; 6, Ethan Godfrey (Glastonbury) 444.40; 7, George Moore (New Canaan) 443.85; 8, Connor Cloud (New Canaan) 442.95. 9, Hadden Gaunt (Wethersfield) 431.50; 10, Tyler Wenzel (Middletown) 423.20; 11, Joel Satir (Greenwich) 420.70; 12, Evan Adams (Farmington) 412.0; 13, Caitlin Inall (Ridgefield) 411.55; 14, Joshua Salem (Trumbull) 408.0; 15, Drew Arnold (South Windsor) 396.80. 16, John Courtemanche (Northwestern) 396.45; 17, Thomas Kehoe (Fairfield Prep) 388.95; 18, Chase Galayda (Southington) 383.65; 19, Parker Smith (Weston) 376.20; 20, John Holland (Fairfield Warde/Ludlowe) 375.0. 21, Emerson Suski (Southington) 363.60; 22, Marcas Racevicius (Holy Cross) 363.10; 23, Nikita Moffly (Weston) 33.20; 24, Logan Barnett (Greenwich) 313.30.